I grow sweet potatoes in containers each year (well, homemade ones at least), and recall that I promised a while back to show my harvest when they were ready. (I think it was to gixx or somebody?) Anyway, here's a video of the first of 2 harvests. I hope you enjoy it! Looks like you got a decent crop out of those bins. Great idea for saving ground space in the garden and to have your soil loose and deep enough for the tubers to grow and develop. Plus, your gardening buddy is quite enthusiastic to help get in the way from time to time. I can see that dog really likes being around you. Your shepherd sure looks fit and well taken care of. Very nice crop of sweet potatoes. We planted some for the first time this year. What are you using for your containers? It looks a lot easier to do then having them in the ground. Any tips on growing them? Ours produced some but would like a better crop next year. gumbo - thanks. It's the only way i've grown sp's, and really like it because of how compact everything is with it. My dog is a real stinker! Lindsey - thanks. That's my dog Jude, and she is 2 years old. As you can tell, she's a real stinker! I'm glad you liked the video. lilcee - Well, the containers are made from some scrap pieces leftover from making a pretty large self watering container. For reference, it's just the top 10" of a 31 gallon rubbermaid tote bin - which has landscaping fabric stapled to the rim, then turned upside down and filled with homemade compost. That's pretty much it. They get watered every couple of weeks, and a fertilizer is added once the vines begin to run - which has a really low percentage of nitrogen. oh my lord, some of those sweet potatoes are just enormous! and your german shep is fun to watch, too! oh, and i had an idea for the last one you dug up that had the arm hangin' off of it. make sweet potato casserole out of it! Last edited by philm00x on Mon Sep 20, 2010 10:58 pm, edited 1 time in total. Awesome harvest I can only hope for a portion of that in my garden this year. Though I did some investigational digging last week and there are some good sized tators in there. I think I might wait a bit but I have been itching to get in there. Love your dog reminds me of my dog when she was younger. I used to sit and throw things right over her head and she would do the Matrix style flipping jumps. It would make any Chinese acrobat jealous. My wife came down while I was watching the video she said "he looks like you". Not so much in looks but in how we do things. Oh love the bin idea. I grew regular potatoes in large pots this year, not that large though. They did pretty good. Not sure what you are doing with the left over soil and don't want to tell you what to do. But when I harvested my potatoes I just up-ended the pots and it was very easy to dig out the spuds. I had trouble paying attention to what you were doing -- I was too busy watching your dog. I suppose with this method, you don't let the vines touch ground, set roots, and start making more potatoes? It would definitely concentrate the energy into fattening up the tubers at the base of the plants. You had some real giants! I noticed that last year when the vines were allowed to sprawl uncontrolled, I ended up with maybe 3 or 4 good ones at the base, 1 or 2 where the vines touched down closest to the base, and tons of pencil thin tubers from the rest. In the case of the really big one you dug up, do you suppose you could have "robbed" it --- just harvested the one -- so the plant would then re-distribute for the rest of the tubers to grow? Finally, how would you rotate here -- no root crops? What else? Oh! and what variety is it? and when did you plant the slips? (Sorry if these were in your blog). applestar - I know - my dog always has to be the center of attention. Nice harvest. I heard that sweet potatoes are one of the hardest things to grow in the backyard garden, do you guys agree or disagree with that statement? I really don't care either way.....I still want to give them a try next year . garden5 - I think climate is probably the most important factor involved for sweet potato production, and it's definitely the easiest crop I grow. However, I have tried irish potatoes 4 times, and haven't been successful yet. Try the Potato Silos. 3'? circles of 24"H chickenwire -- mine are squashed into 2'x4' semi-circles against the fence. 5 seed potatoes/silo. The ground underneath was solid compacted clay subsoil lawn. Forked, soaked, piled with grass clippings/weeds, unfinished compost, cardboarded, then soaked again. Chickenwire circles secured in place, then piled with HAY *not* straw, more grass clippings, and straw. X's cut into the cardboard and seed potatoes snuggled into the moist ground below. 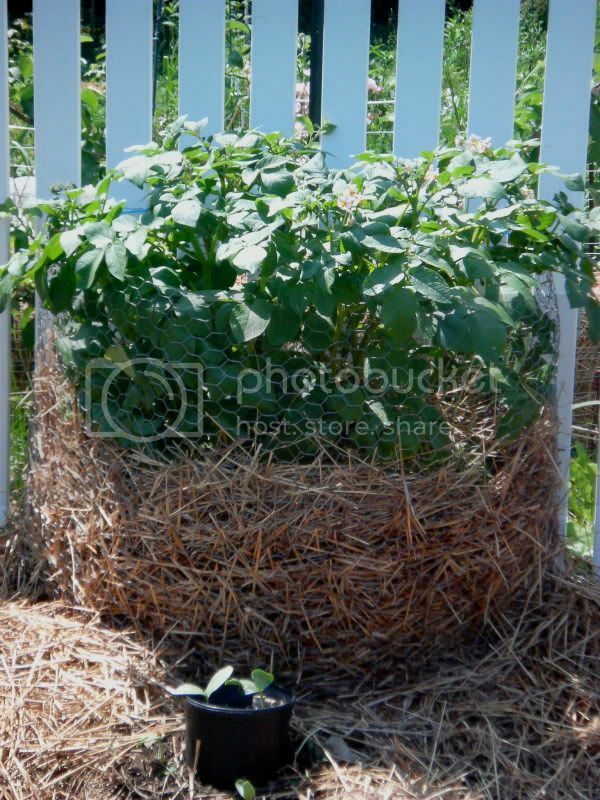 Mulched with more hay, occasionally compost, and grass clippings as the potato plants grew. *I'm concerned for my sweet potatoes, some of which are planted in the same area. I should probably try digging around a bit, though I really need to wait until at least the end of the month for good potato development. Wow nice harvest. I have to agree with applestar, you dog is very entertaining. We tried the potato buckets / bags they sell just for the fun of it and they didn't produce much at all. garden5 wrote: Nice harvest. I heard that sweet potatoes are one of the hardest things to grow in the backyard garden, do you guys agree or disagree with that statement? Definitely give them a try they are maybe not THE easiest to grow but one of the easiest and very productive too. The only down side is they take up a bit of room. But the results are very much worth it. Maybe people say that cause they are a pain to start unless you know what your are doing.